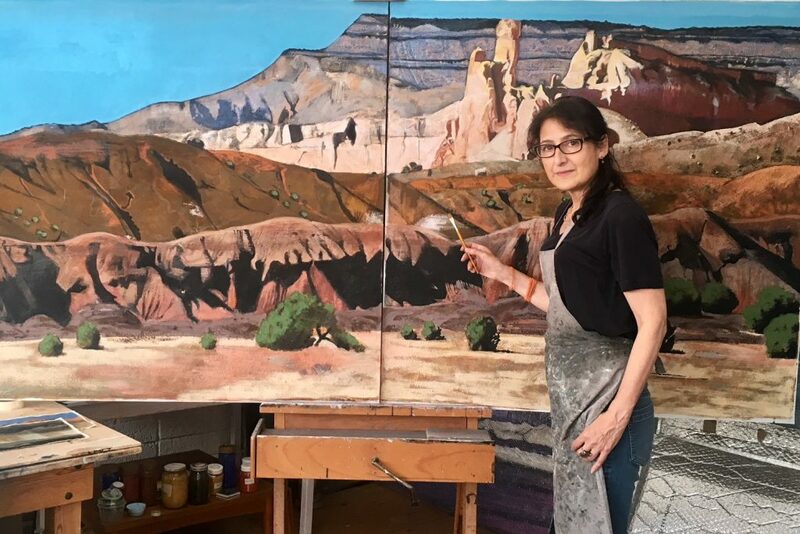 Lydia Bauman is a highly skilled mixed media landscape painter who recently has embarked upon a project in which she locates and re-interprets Georgia O’Keeffe’s iconic landscapes of New Mexico. 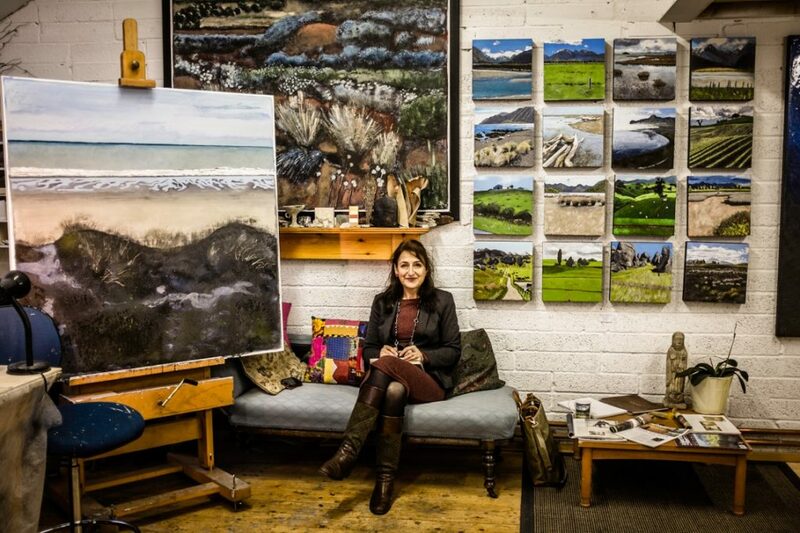 We caught up with her to find out more about this project, which will be exhibited at the Mall Galleries early 2019, using funds generated from her Kickstarter and her general practice. Debbie Chessell: Thank you for talking to us Lydia, I’m very excited to hear more about your project ‘Looking for Georgia’! Can you begin by giving our readers an overview of your career and explain how your experiences as an artist have led to starting this project? Lydia Bauman: Between the ages of 12 and 15 I found myself with no language because of two successive emigrations – from my native Poland to Israel and three years later from Israel to the UK. It was while I was learning new languages, that painting and drawing began to present itself as a viable means of expression. It was, strangely enough, my father (normally they want us to have a “proper job “ don’t they?) who persuaded me that art could become something more than an introspective teenager’s escape route. I went on to study fine art at Newcastle University. I then followed it by an MA in Art History at the Courtauld Institue in London and my path was set. To this day I happily walk down that path and I never once looked back. I guess we all have certain epiphanies along the way which take us down one or another trajectory as artists. I had a few, including such unexpected and seemingly unrelated things as the sight of a seagull over the Baltic Sea, a miserable moment over the bunsen burner at a chemistry lesson at school in Leeds, coming face to face with a square painting by Monet on the top floor of the Musée d’Orsay in Paris … I might tell you about those another time, but the most significant epiphany was the one involving my landlord at a lovely, romantic flat above the Old Red Lion pub in Islington. One day he was decorating the bathroom and filling the cracks in pink plaster with a white filler. I thought those fine lines, the overlaying of chalky textures and colours, just about the most beautiful effect I have ever seen! For someone who never felt satisfied with traditional media of oil, acrylic and watercolour, because of their inherent smoothness, this was a true epiphany. I bought my first pack of Polyfilla and the rest is history. I have since enriched my technique with the addition of resins, waxes, texture gels, embossing powders, patinas, rusting solutions, sand, grit, glitter – and I’m still looking. From first experimenting and honing my techniques with the subject of Still Life, I moved on to landscape. 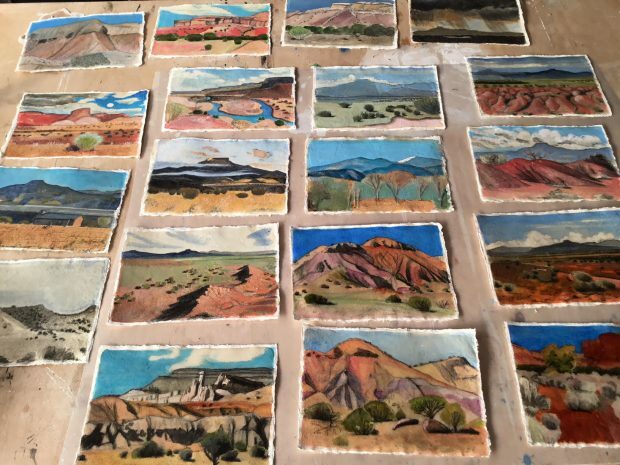 My technique served me well in conveying something of the physical quality of landscapes as different as the cultivated fields and meadows of Europe to the wilderness of Morocco, Australia, New Zealand, Israel and now finally, the most challenging of them all – New Mexico. Debbie: Your creative process is made up of many steps including sketching from life, taking photos, making studies and creating larger works. Can you talk us through the importance of these stages and how they relate to one another? 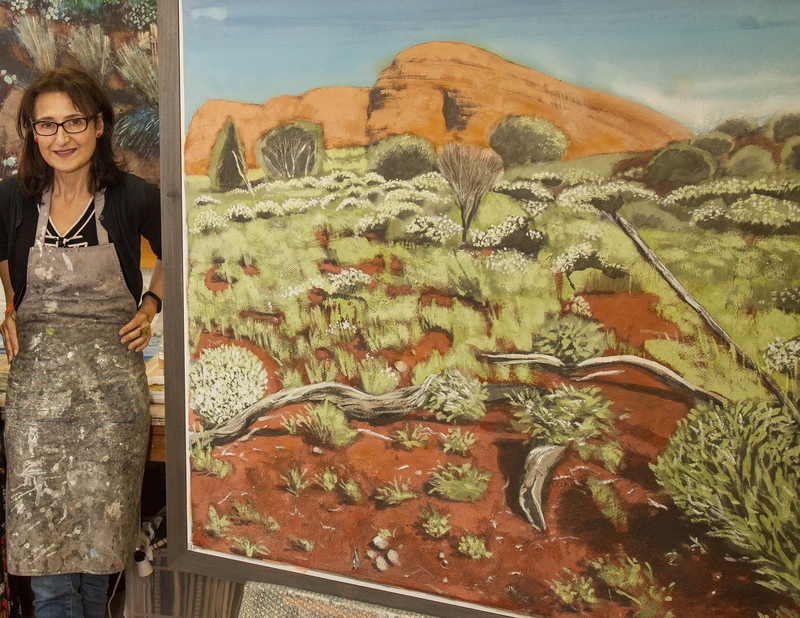 Lydia: Sketching outdoors is never an essential step for me in the process of painting, it’s just a way of paying close attention to the detail of the landscape, of getting right into it, in a way that the instant camera click can never provide. I do work from photographs but the very act of taking the photo – selecting the square format, aiming my viewfinder, choosing a composition – is already a preliminary act of creating the work. I then take that image as a starting point and because it is already at a remove from the original view, it helps me to concentrate on the things that matter – composition, colour, texture. In other words, I move away from ‘ a view’ in a literal, topographical sense, towards an event on the surface of my panel. 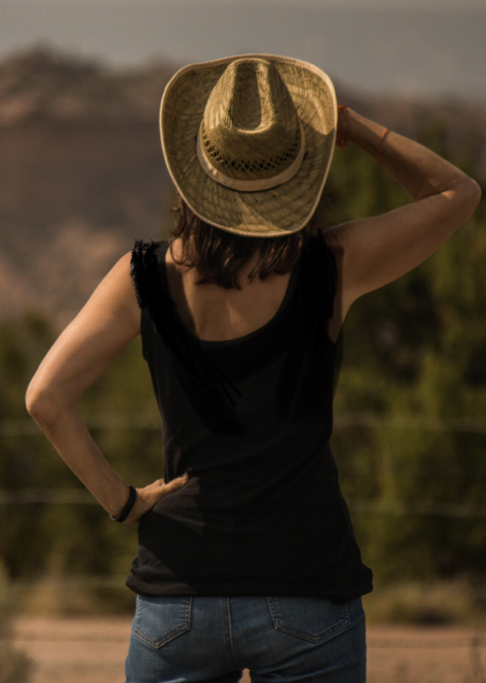 Debbie: You mentioned that you tend to dislike working in plein air because of passersby watching – what did you do to deal with this when you were working out in New Mexico? Also, how did you set up a space for drawing outside (for example did you use an easel, what style sketchbooks did you use, what drawing tools did you work with)? Lydia: This was not a problem. When I was planning my trip I knew that I wanted to have my very first glimpse of Georgia O’Keeffe country in the light of dawn. 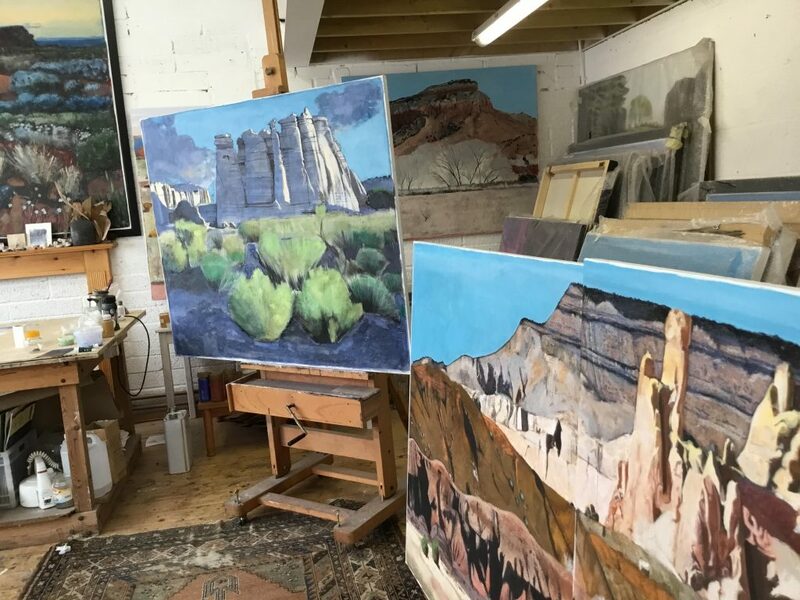 I booked a yurt (through Air BnB) in the middle of the desert, close to Georgia O’Keeffe’s home and studio at Abiquiu and just down the road from Plaza Blanca, the White Place which she loved to paint. 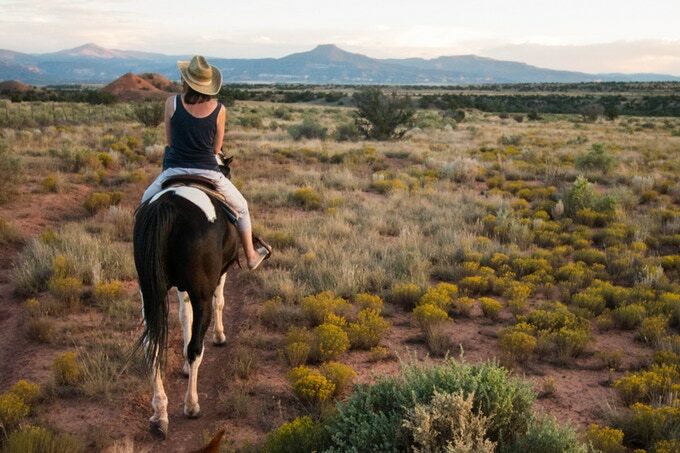 I arrived there from Santa Fe after dark. At 5 am I watched the sun rise and reveal the landscape to me, the colours reaching saturation and the forms full definition by 6 am. It was an unforgettable experience. There was no one around except my son who was my driver, interpreter of local American Indian culture, note taker, navigator and on that occasion coffee maker and videographer. In this clip, I’m using a wonderful panorama sketchbook and watercolour pencil both from Jackson’s! Having tried pen and ink which invariably spilled in my luggage, technical pens which were just too rigid, charcoal and chalk sticks which were far too messy, I finally found this ideal implement. Light, neat, responsive, lovely to use. 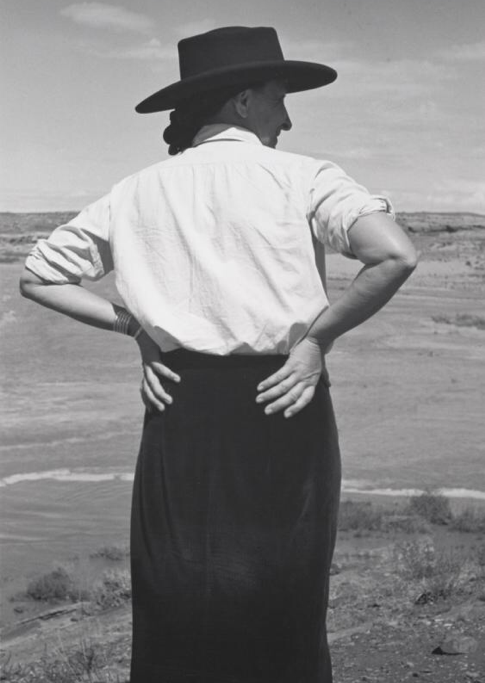 Debbie: Georgia O’Keeffe regularly worked directly from looking at the landscape whereas, due to your complex use of a vast array of mediums and limited time in New Mexico, you tend to create your bigger landscapes back in your studio working from photographs, studies and drawings. Which method of working do you feel creates more accurate representations of the landscape and why? Lydia: Do you need to know a place well to paint it well? This was one of the questions which propelled me to go to New Mexico and look at reproductions of O’Keeffe’s paintings in front of the very motifs she represented. How ‘ accurate’ were they? it turned out not at all. In her modernist way common to all early 20th is century artists, she preferred to flatten, crop, smooth out, simplify both form and colour, even while living and breathing that landscape for five decades. Frankly, it’s as if the design was more of interest to O’Keeffe than her passion for the place which she repeatedly professed to have. And of course she mostly painted from the inside of her car, so the canvases were of necessity modest in scale. The result is that we respond to O’Keeffe’s work as a purely aesthetic, rather than emotional experience, ironically removed from reality. And then there was me, an artist from Europe, setting foot in the place for the first time in her life, looking around and after two weeks returning to London with photos, sketches and memories and using that as a starting point. 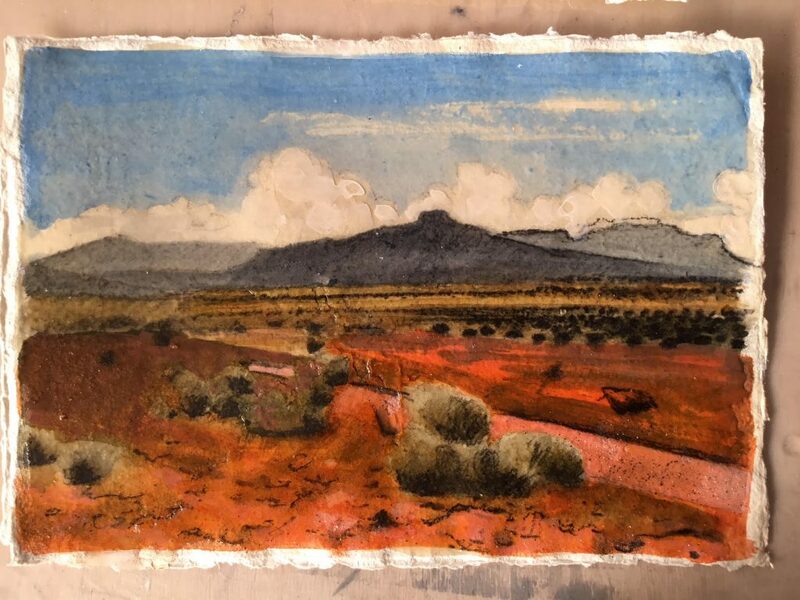 But then unleashing my great arsenal of mixed media techniques to get to grips with the visual power of New Mexico – not holding back on the texture, the physicality, the scale of that magnificent place. I’d like to think that the response of my viewers to those paintings will be as visceral as the experience of being there in the landscape. 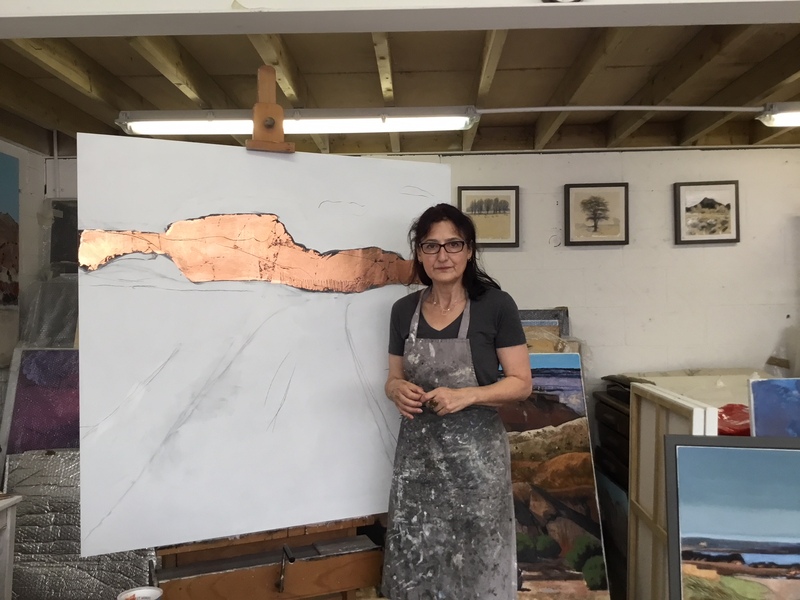 Lydia Bauman in her studio, building up a mixed media painting. Photography by Lydia Bauman. Debbie: Your education at the Courtauld and experience giving guided tours and lectures at the National Gallery, on cruises, art holidays and private tours have given you a great background in art history – how do you feel this impacts your work? Lydia: None of us can be free from the weight of the art that came before us, whether we are specialists or just occasional gallery visitors. It’s like the language we speak – it might have lots of new words and concepts in it, the dialects may have evolved, but it’s the language that has been recognisable for centuries. The art we produce today is a culmination ( even if it takes the form of rejection) of what came before. Obviously, a regular habit of looking and analysing great works of art inevitably leaves a trace. A more considered use of composition or colour. The awareness of the possibilities of certain techniques. A familiarity with the language of symbolism and allegory. But you take all that and distil it into your own voice. That recognisable ‘own voice’ to me is a prerequisite of any decent artist. 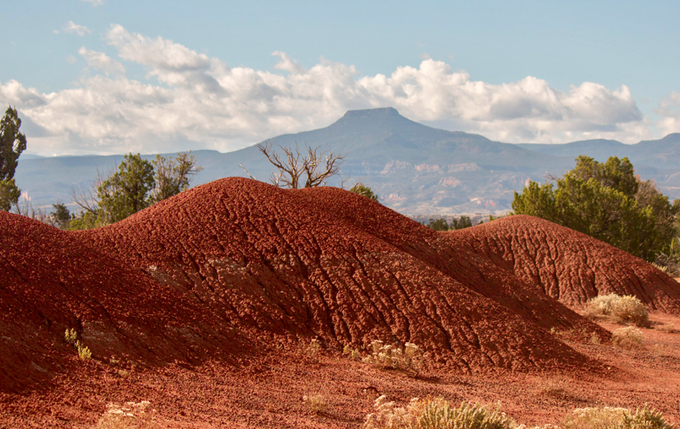 Part of the reason for this project – reinterpreting Georgia O’Keeffe’s country – is to show that there are as many “takes” on a subject as there are artists interpreting it. As long as the artist speaks with her/his own voice. As a legendary Art historical figure Georgia O’Keeffe might cast a long shadow and may have appropriated that landscape for herself ( Northern New Mexico is known as Georgia O’Keeffe country, and she called the whole area “my backyard”) but my challenge is to add something to the appreciation of that landscape through my own techniques and vision – my own voice. This is where contemporary art can engage in a fruitful dialogue with art history. Debbie: You use colour and unusual mediums very instinctively throughout your work and create absolutely stunning balances between texture and tone. How do you bring these two qualities of painting together and do you feel that having an element of chance is important to your work? Lydia: If you ask a centipede “ how do you remember the sequence with which you put one foot in front of the other with so many feet at your disposal?” and if it tried to think of an answer it would probably immediately trip up. Likewise, I can’t quite answer this question – as you say my choices are intuitive. Of course, I could analyse them – but it might all get rigid and formulaic. Chance is literally a very fine thing, a lot of the effects I achieve happen purely organically, by chance. There is no way of knowing how artificial rust or patina might bloom on the surface of my painting or how resin will flow and how much sand it will trap. With experience, you can control some of the results but it’s the surprise element that keeps the process fresh and exciting. I dread the day when I wake up without the hope that something in the studio that day will surprise me. Debbie: Do you have to be in a certain headspace to make work? If so, how do you achieve it and keep your concentration? For example, do you have specific routines that you follow when you get to the studio or have your space arranged in a certain way? Lydia: The headspace depends entirely on what goes on outside of it. The certainty that I have an uninterrupted day ahead, or better still an uninterrupted week gets me into a momentum with work and a fruitful concentration follows. Routine is invaluable. An ideal day would be to arrive at my favourite neighbourhood cafe, l’Atelier Dalston, at 8 am sharp at opening time so that I can get my favourite table and work for a couple of hours over a great latte on a lecture if I have one coming up. Then it’s a 5-minute walk to my studio at the Chocolate Factory N16 right next door to Jackson’s. Putting my apron on, which I’ve had since my student days, instantly switches my gears from art history to art practice. Woman’s hour is a must, followed by coffee at 11. I work till 3 then home for a couple of hours admin, catching up on correspondence, domestic stuff, then maybe something social in the evening. That’s the ideal, but it’s often interrupted. Guess what I’m saying is that it is routine, not that mythical muse or inspiration, that makes things happen in the studio. Getting the job done. Inspiration is written into our DNA as artists, we don’t have to wait for it. If it doesn’t seem to come, it’s because we have allowed it to be sabotaged, by things, people, but mostly by ourselves. Lydia Bauman in her studio, photography by Lydia Bauman. Debbie: When I visited your studio we discussed how the contemporary art world has a tendency to disregard paintings that are aesthetically pleasing or could be labelled as ‘beautiful’. How do you navigate this as a landscape painter? Lydia: My favourite artist Henri Matisse was unapologetic about his work being perceived as decorative. He didn’t mean decorative in the sense that a wallpaper or curtain fabric is decorative. He meant aesthetically pleasing, beautiful. He said he wanted Art to be like an easy armchair in which to rest after a hard day’s work. Today, beauty is an ugly word. It is not seen as a sufficient reason for creating. Art is expected to show grit, unvarnished truth and to embrace and reveal, for all to see, every unappealing manifestation of our imperfect world. It needs to show guts. It needs to engage in a parallel shouting match with our tv screens broadcasting bad news. I’m siding with Matisse. We all NEED beauty. Recently I was a guest speaker on a Dutch waterways cruise, the weather was awful, skies overcast, Dutch landscape grey and flat. Everyone was miserable. Then we arrived at a stunning tulip garden overflowing with colour. I looked around me – every single person had a big grin on their face. Not saying that we should turn a blind eye to the world’s misery, cruelty, injustice. Just saying that once we’ve had enough we could do worse than allow ourselves to enjoy beauty. Beauty, if not a solution, is the antidote to every ill and every shortcoming of our world. It is truly redeeming. And so, like Matisse, I’m not apologising when people say they find my landscapes beautiful. What they mean is not just that the particular view is beautiful (and I don’t go for the picturesque or postcard-pretty views) but that something in the process of transforming a scene into a painting caused it to acquire a certain aesthetic resonance which goes over and above what the subject, however magnificent in itself, has to offer. Yes, I am after beauty – I will reposition that bit of vegetation slightly to the left to get a better balance, I will take some liberty with my colours to make them sing, I will bring out my gold leaf, my mica particles, to show the splendour of sunlight reflecting on a rock. Every square and rectangle I paint on has to have its own aesthetic integrity and strength. Georgia O’Keeffe made sure of that too. Debbie: I loved that you had ‘The Advantages of Being a Woman Artist’ by the Guerrilla Girls tacked to your studio wall! You’ve spent a lot of time studying why women artists throughout history were not able to achieve the artistic career their skills deserved and questioning whether artists like Georgia O’Keeffe, whose work was exhibited and championed by the famous modern art promoter Alfred Stieglitz very early on in her career without her initial permission, would have achieved such legendary status without the support of such powerful figures. As a woman artist yourself, do you have any tips for other women on negotiating the minefield of the art world? Lydia: I won’t embark here on the ways in which women were blocked, sidelined and disregarded all along their artistic careers throughout history. Most of us know at least some of the story. Today we are playing a more even field and so the same applies to artists of both sexes – we all need champions in order to thrive. I take nothing away from O’Keeffe’s undoubted talent and cutting edge position on the art scene of the early to mid 20th century, by saying that she could not have made it by herself. Not when she spent 50 years alone in the desert, away from the art circles of New York, and not at a time in which the Art establishment still felt it was ok to advise a woman artist that if even men couldn’t paint New York well, she certainly should not bother. It took the influential gallerist Stieglitz telling art critics that she is “the female Picasso’ and them and their readers believing it, for her to become as prominent and as successful as she was. Why did Van Gogh languish in obscurity and only sell one painting in his lifetime? Because he was rubbish at networking. Not even his art dealer brother Theo’s efforts in promoting him could overcome the essential unattractiveness of the man. Stieglitz’s semi-naked, straight-out-of-bed photographs of his wife Georgia, his extraordinary assertion that she painted ‘from the womb’ and her own fabulous style and wit, provided a much more marketable package than poor Vincent could ever aspire to. But unlike Georgia, he wasn’t interested. What we create and how we are promoted are two very different, often alien things and we need to submit to the process, however unpalatable, if we want that shiny bit of success. I remember once objecting to some outlandish claim my then gallerist was making about my work in a press release and being told: “ you’re not made for the big time”! If you are a woman contemplating making art your life, I’d say don’t let the prospect of possible motherhood further down the line let you think that you cannot do it. You can. Georgia O’Keeffe had the luxury of having no children. I have two and to prevent any possibility of slacking off after the birth of my daughter, I planned my first major West End exhibition at the Rebecca Hossack gallery just six weeks after giving birth. Not soon enough after birth to have everything ready beforehand and rest on my laurels, nor so far away that I could afford to stay away from the studio for too long. I left an unfinished painting on the easel, went off to have my baby, came back and the moment I started twiddling my thumbs ( about a week later) I went back to the easel to finish that work. I have avoided participating in women only exhibitions, not wishing to be categorised and ghettoised in this way. Maybe I would if my work was politically motivated in terms of my gender. I have a total commitment to women’s equality and women’s rights ( human rights in general) but my art is a politics-free zone. I was pleased when a visitor to a show of mine tried to guess the gender of the artist and failed. There is good art and there is bad art and as a woman artist, it is your duty (as is the male artist’s) to be responsible for your own talent, nurture it and not let anything stop you in your tracks. I would be very interested to hear from readers who would like to respond to some of the issues which are raised here. Please leave comments, ask questions, share your story. Debbie: Where can our readers find out more about your upcoming exhibition and your work? Lydia: The exhibition Looking for Georgia will be at the Mall Galleries, London SW1 25 Feb – 2 March 2019.
stock this but you can find stockists on line. Sorry Gary, typo alert ! too early in the morning .